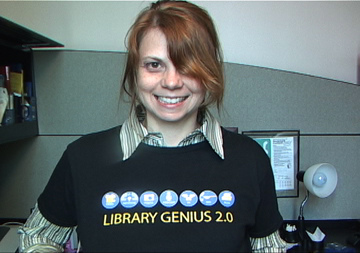 Library Genius 2.0 Shirts are now Available! In my post of August 8, I wrote about the very cool Library Genius 2.0 t-shirts that Kay Gregg and Sean Robinson of the Allen County Public Library created for the Learning 2.0 program for the library staff that the ACPL is going to kick off on Sept 19 when Stephen Abrams, VP of Innovation at SirsiDynix comes to speak on Library 2.0 at the ACPL. By the way, this talk will be open to the public. Here is a picture of Kay modeling the t-shirt. Well, everyone really liked the t-shirts and the icons and had been asking them where they could get one for themselves or for their own library’s learning programs. So Sean and Kay set up a store under Printfection/library2_0 where you can buy these shirts and some other styles like long-sleeve t-shirts and baseball shirts and others and also tote bags and aprons and mouse pads. They come in a ton of colors and there is a good discount for bulk purchases. They are cheapest in white, a little more in light colors and a little more than that in dark colors. You can see all the wholesale pricing options by picking style and color and then clicking on the pricing tab. Helene Blowers, Public Services Technology Director for the Public Library of Charlotte & Mecklenburg County (PLCMC) and creator of the Learning 2.0 concept, wrote about these shirts on her blog, librarybytes.com. ACPL sent her a shirt in appreciation of her work on Learning 2.0. Here is a picture she took of the shirt and buttons. Sean and Kay are working on creating buttons for this also and they will put them in their store on cafepress (along with some other things like messenger bags and coffee mugs) since Printfection does not have buttons as an option. They already have the bags and coffee mugs there, but need to upload the individual icons to create the buttons. If you are interested in the buttons, check back on the cafepress store because they are working on getting them created right now. Cafepress has a lot of options of different types of items, but Printfection is less expensive and offers wholesale prices also. I’d go to Printfection unless there was a particular thing you wanted, like the messenger bag (which I really want!). Or the buttons, since that is the only place to get them. It does appear they have a way to offer the buttons in batches, like of 10, or 100. Also, other libraries, such as the Harris County Public Library are using the icons that Kay created for their own Learning 2.0 programs which is what Sean had hoped people would do. He wanted to be able to contribute to the Learning 2.0 program. You can read about this and their other ideas, initiatives and Learning 2.0 projects in the ACPL Innovation Through Technology blog. Many people in many libraries have worked on Learning 2.0 and Library 2.0 and have shared with each other to create great things. Cooperation, collaboration and sharing. That’s what its all about! You are currently browsing the archives for the printfection category.